Story blurb: Brian Thompson is living a lie. A successful businessman, Brian can’t stay focused in a real relationship and cheats on Timothy, his longtime lover. A phone call from his younger brother Joey, whom Brian hasn’t spoken to in years, makes him recognize the uncanny resemblance between the two men. Joey is, in a word, perfect. In Brian’s eyes, he always has been. When their mother is hospitalized, Joey asks his older brother to come home. He tells Brian he needs him, which is just what Brian wants to hear. But the long trip north gives Brian plenty of time to think about his brother, and he comes to realize an unsettling truth — he is in love with Joey. Suddenly Brian admits that he wants Joey in ways he knows he shouldn’t. Can he come to terms with the way he feels before his unrequited love threatens to tear him — and his relationships with both Timothy and Joey — apart? In 2010, Snyder founded JMS Books LLC, a royalty-paying queer small press that publishes in both electronic and print format. 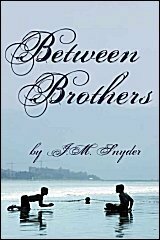 Quite often readers come to my blog searching for stories dealing with “brother-to-brother-love,” and so this week I offer a novella on that very topic. I do have to say from the start, however, that Brotherly Love, by J.M. Snyder, [JMS Books LLC 2010], is not incestuous in a physical way. Rather, it is a visceral love story in a contemplative way. The story is written in the first person from Brian’s point of view, and using him as her canvas Snyder paints all the various hues of a rake: self absorbed, selfish, lascivious and a cheat. However, what absolves him to some extent is that he readily admits his shortcomings, and even chastises himself for them. He is nonetheless devoted to his younger brother, Joey—perhaps ‘obsessed’ would be a more accurate description—with whom he is both emotionally and romantically inclined. It is an unrequited romance, however, and the novel is primarily about how the two deal with this dilemma. Appearing opposite his older brother, Joey is perhaps more mature inasmuch as he is neither judgemental nor recriminating in dealing with his brother’s feelings. Indeed, his love for Brian never waivers throughout the entire story, and in the end it is this devotion that helps Brian find his path again. Because of the bold subject matter, along with some superb insights and top-notch writing, I have no hesitation in recommending this novella to anyone. Five bees. The Russian Interior Ministry, which is responsible for the police, has confirmed that those who break Russia’s ban on the promotion of gay lifestyles to minors will face arrest at the Sochi Winter Olympics Games next year. It is a collection of little-known people, facts and events in Canadian history, and includes a bibliography of interesting books as well. Latest post: Roncarelli v. Duplessis, 1959, Supreme Court of Canada. Probably the most important decision in pre-constitution law.